Screw Size – The Screw is the heart of the extruder. It is measured in outside diameter most extruders are between .75”-10”. The most popular sizes are 1.5”, 2.5”, 3.5” 4.5 and 6”. The effective length of the extruders typically 24-36 L/D although can be shorter or longer for specialized applications. The L/D of a single screw extruder is the ratio of the length over the diameter. Motor and Gearbox – Extruders are variable speed with either an AC motor or DC motor. DC motors have been the longstanding standard for years, however AC motors are becoming more and more popular with plastic processing. These motors can be direct driven or belt driven to gear reducers. It is important to be aware of the gearbox reduction on the single screw extruders to maintain proper screw output speeds for your material. 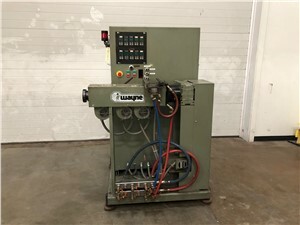 Barrel Cooling – Extruders will can be equipped with Air cooling or water cooling. Air cooling which is done with fans in in general less difficult to use. Water cooling is a more effective then air cooling, however tends to require more maintenance and in general more difficult to maintain. Feed Throat Size and Geometry – The opening and shape of the feed section of an extruder should be chosen with the material and bulk density in mind. Screw Design – There are many different variations of extruder screws. Conventional single stage screws have a constant pitch. Two stage screws are used for venting. Screws also can have various forms of mixing for specific applications. Above is a very brief description of the components of a single screw extruder. 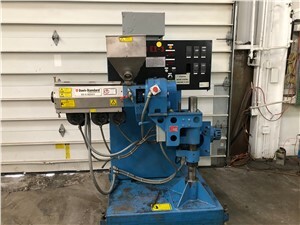 Please feel free to contact and Arlington Machinery salesman to help find a used extruder that will fit your application.